Putting the future of your finances in the hands of a someone else? To some, that may sound a little crazy. Well, as crazy as it sounds, it’s something people do every day. They do so for a good reason, however. Simply put, they are aware that they need professional assistance with planning their financial future. It’s clear that choosing a financial planner; rather the right financial planner, is an important decision. Yet, even with this knowledge, it seems that so many people rush into the decision of hiring a financial planner, choosing the first name that pops up on Google without giving it a second thought. This isn’t the way to go about things. If you’re serious about your financial future, then you need to be serious about choosing your financial planner. Luckily, choosing the right one isn’t as difficult as it may seem. Read on to learn how to choose the right planner for you. First things first, let’s clear up some confusion that often occurs when researching financial planners. After searching for financial planners online, you may find the term “financial advisor” popping up as well. In fact, you may even see this term is used interchangeably with the term financial advisor. More often than not, there is no difference, and these terms are used interchangeably. Sometimes, however, you will see the term financial planner being used to describe someone who helps people set up a method to resolve a specific financial problem. The term financial advisor is often used to describe someone who implements a financial plan by choosing specific investments and insurances. Basically, they are both often used as generic terms to describe the process of helping someone else out with financial issues. For simplicity sake for this article, we’ll stick to the word financial planner to avoid any confusion. The more clued in you are on your personal financial situation, the easier it will be to choose a financial planner. Now, we don’t just mean knowing how much money is in your bank account and how much money you spend each month. In order to find the right financial planner, you need to take a deep dive into understanding your finances. Think about the problems you often face financially, as well as potential issues that might pop up down the road. Think about your goals for your financial future, as well as how close you are to obtaining these goals. Do some independent research on what it takes to reach your financial goals, as well as research on what it takes to overcome your financial issues. Doing this will give you a better framework regarding what you need when it comes to a financial planner. Once you’ve learned about your own financial needs, it’s time to start the process of screening different financial planners. The easiest way to do this is to start with the different pay structures, as this will make it easy to categorize your options. There are three different types of financial planners you have to consider: fee-only, fee-based, and commision-based. Let’s take a quick look at what each one of these means. If you need comprehensive financial planning, or you need someone who can do asset management, then a fee-only financial planner is likely the way to go. These planners are typically under a fiduciary duty to act in the best interest of their clients. Unsure if the person you’re speaking with fits the bill? Ask them to sign the Oath. The only way they can make money is through hourly rates, retainers, or through the percentage of the assets they manage. They don’t receive any type of commission based on selling you a specific product or investment. The types of comprehensive advice they give includes advice on investing, estate planning, retirement, taxes, and education funding. Fee-based financial planners typically have an affiliation with an agent/broker. Because they sell investments and insurance, they also generally hold a license. Understanding the fee-based planner position can sometimes be confusing. This is because, just like a fee-only planner, they also provide financial planning for a fee. However, there is one crucial difference. Fee-based planners, unlike fee-only ones, also sell products and receive commissions. 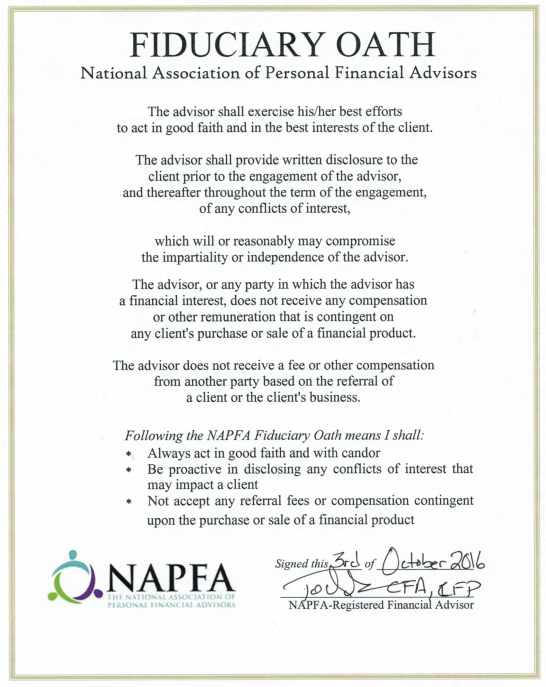 Therefore, there is often a conflict of interest with fee-based planners, as their recommendations are often for products from which they receive a commission. Last but not least, we have the commission-based financial planner. Commission-based planners are also often referred to as brokers, registered representatives, or insurance agents. Just like fee-based planners, these planners also receive a commission on the products they sell. These products include things such as annuities, insurances, and mutual funds. So, just like a fee-based planner, there is also a conflict of interest, as they will receive a commission on the products they sell. They work for the company they represent and not necessarily for you. They are not held to the highest standard of care. As long as their product is suitable for someone like you, then it may be sold. The question then arises: is this the best solution for me or the planner? These people are often also employed by large financial institutions. The next step to choosing the right financial planner is to figure out what kind of help you need. Let’s take a look at the different options available based on the help you need. If you need help managing your assets, then you’ll want a financial planner who is with you for the long haul. This person can help you invest and manage your money at each stage of life. They can also provide you with comprehensive financial planning at each stage of life as well. These planners will charge based on a percentage of your assets or on retainer. Do you need help figuring out a particular financial situation? If so, then a financial planner who will meet for an hourly consultation is right for you. These specific financial situations could be anything from selling a business to purchasing a new house to going back to school. These planners charge based on the hour, and after an initial consultation, they should be able to give you an estimate based on the amount of work they project will be needed to help you. The other option is a financial planner who can help you with comprehensive planning. This is the person you want to hire if you are looking for a roadmap to reach your financial goals. These people will look at the big picture, and they will take every aspect of your financial life into consideration: your retirement, insurance, investments, and education. You want to choose a financial planner who has your best interests in mind. That’s where the term fiduciary comes in. In short, a fiduciary financial planner is someone who has taken a pledge to always act in the best interests of their client. If a financial planner is not a fiduciary, that means they are often not held to as high as a standard. If they are not a fiduciary, that means they can get away with selling you products that are merely suitable, rather than products that are 100 percent in your best interest. If a prospective financial planner is not a fiduciary, it’s usually best to look elsewhere. Before hiring a financial planner, you’ll want to do a little background checking as well. First things first, ask the prospective financial planner if they’ve ever been convicted of a crime. Also, ask them if they’ve ever been under investigation by a regulatory body or an investment industry. Once they’re cleared of these questions, research their education and background. Have they completed the education and training to be qualified to help you? Need to know what questions to ask? Look here for examples of questions we recommend you ask anyone looking to provide financial planning services. Before selecting a financial planner, you will also want to make sure they have the right credentials. There are a few different certifications and licenses your financial planner may possess, some of which include a CPA, CFP®, CFA, or ChFC®. The CFP®, which stands for Certified Financial Planner, is usually known as the gold standard of the industry. In order to get their CFP®, advisors must have several years of experience, take extensive courses, and they must pass an exam. Those with a CFP® are held to strict ethical standards, and they also must complete continuing education. As you can see, there is a lot that goes into choosing a financial planner. Or, if you’re ready to get starting on your financial planning, please do not hesitate to contact us today.